The Cockroach is an insect that exist worldwide, with the exception of the polar regions and in elevations above 2,000 m (6,500 ft). Cockroaches are generally scavengers. Cockroaches are mainly nocturnal, and will run away when exposed to light. 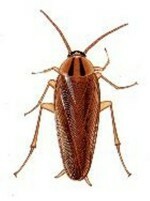 A peculiar exception is the Oriental cockroach which is attracted to light, thus making it a far more annoying pest. Roaches are called the custodians of nature. They only live in houses where there are crumbs to eat or the garbage can is uncovered. They lay eggs inside the house’s hollow walls. The roach is also one of the hardiest insects on the planet, capable of living for a month without food and remaining alive headless for up to a week. It can also hold its breath for 45 minutes and has the ability to slow down its heart rate. 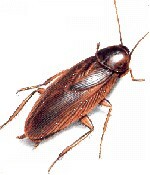 The American cockroach is a large species of cockroach, winged, and growing to a length of 1″ to 1½” (2.5 cm to 4 cm). It is very common in the southern United States. In the southern U.S., it is often called a Palmetto Bug or a Waterbug. It prefers warmer climates and is not cold tolerant. It does well in moist conditions but also can tolerate dry conditions as long as water is available. The insect is often considered a pest since it invades living quarters for sanctuary and food. The German cockroach is a small species of cockroach, measuring about 1/2″ to 5/8″ long. It is tan to light brown, and has two dark parallel streaks running from the head to the base of the wings. Although it has wings, it is not very skilled at flight and is unable to sustain flight. 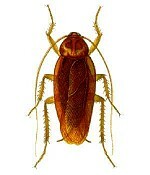 The German cockroach is one of the most common and prominent household cockroaches in the world. The German cockroach is very closely related to the Asian cockroach, to the extent that to the casual observer they appear nearly identical and may be mistaken for the other. The German cockroach is very hardy and resilient towards attempts to exterminate them. The cockroach is also smaller than many other species so it can more easily hide and fit into very small cracks and crevices to evade humans. The cockroach can be seen in the day, especially if there is a large population or if they have been disturbed. However, they are nocturnal, and therefore most active at night. The Oriental cockroach is a large species of cockroach, measuring about 1 inch in length at maturity. It is dark brown to black in colour and has a glossy body. The female Oriental cockroach has a somewhat different appearance to the male, it appears to be wingless at casual glance but has two very short and useless wings just below its head. It has a wider body than the male. The male has long wings, which cover a majority of its body and are brown in colour, and has a more narrow body. Neither the male or female can fly, apparently. The oriental cockroach tends to travel somewhat more slowly than other species. They are often called waterbugs since they prefer dark, moist places. They can often be found around decaying organic matter, and in sewers, drains, damp basements, porches, and other damp locations. They can be found outside in bushes, under leaf groundcover, under mulch, and around other damp places outdoors. The Smoky Brown cockroach is a large species of cockroach, winged, and growing to a length of 1 1/4″-1 3/8″. It is brown in colour. It is closely related to the American cockroach however is easily distinguishable from it. It has a uniformly dark brown mahogany colour. 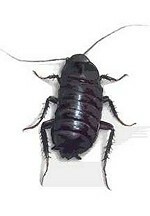 Its thorax is dark and siny, unlike the light rimmed pattern of the American cockroach. It is very common the southern United States, and in tropical climates. It does well in moist conditions and it sems to be most commonly concentrated in moist concealed areas. It often lives around the perimeter of buildings, and it is common species outdoors in souther US states.